Stained glass can be a beautiful and relaxing hobby. 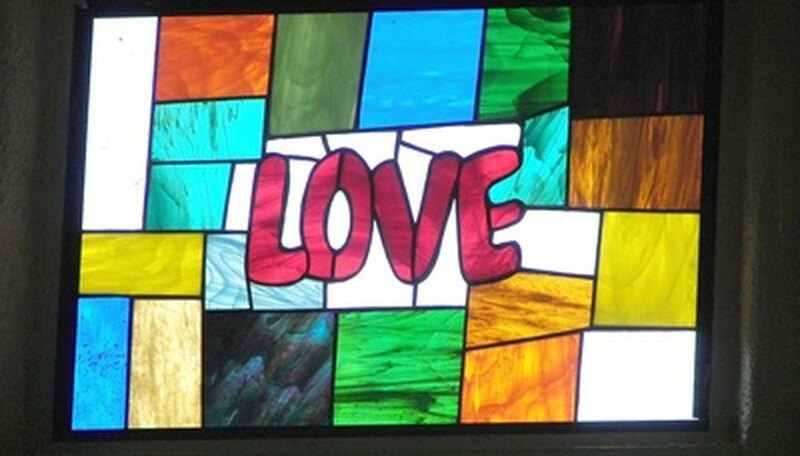 There are many types of stained glass, but caned stain glass is one of the oldest types of stained glass. Referred to as both "cane" and "came," this material comes in many types: zinc, copper, brass and lead. But lead is the most common form of cane. The cane is used to hold colored pieces of glass into place. Cane comes in two shapes: H-shaped that is used in between two pieces of glass and U-shaped, which is used around the edges of the piece. Choose a pattern for the stained glass project. Beginners should choose a square or rectangular pattern with large and simple geometric shapes. Make three copies of this pattern. Tape the pattern to a piece of wood several inches longer and wider than the planned stained glass. Make sure the tape doesn't cover any of the lines. Nail the wood scraps at the top and sides of the piece. Place them right up to the outside lines of the piece on the pattern. Stretch the cane. Two people, each with a pair of pliers, grasp the end of cane and pull. Be sure to grasp the bottom part of the channel, known as the heart, with the pliers. Holding the cane by the sides or faces, will warp the cane and make it unusable. Cut the U-shaped cane to fit the top and sides of the piece. Use the snips or wire cutters to cut first the faces and then the heart of the cane. Do not cut all the way through the piece with one snip or you will risk warping the cane. Cut the faces at the ends at 45-degree angles. Cut one of the patterns into pieces following the lines. Place each pattern shape on a piece of glass and cut around the edges of the paper with the glass cutter. Carefully separate the glass pieces. Starting at the top of the project, slide each piece of glass into the channel over its spot on the pattern separating the glass with the H-shaped cane pieces. Fill in the entire pattern. Cut a piece of U-shaped cane for the bottom and slide it into the channel at the bottom of the project. Paint the edges of all of the joints with flux. Use a small brush and be careful to keep the flux off of the glass. Solder each joint, making sure that solder drips into the joints, sealing them completely. Clean any excess flux or solder off the edges of the project. When the project is completely cool, remove it from the wooden board. Working with lead can be dangerous. Do not smoke, eat or handle food after handling the lead cane. Wash hands frequently. Keep the cane out of the reach of children and be careful to pick up and dispose of any small scraps of cane or solder.